The <?xml:namespace prefix = st1 ns = "urn:schemas-microsoft-com:office:smarttags" />New Zealand Ecolabelling Trust is a voluntary, multiple specifications based environmental labelling programme, which operates to international standards and principles. Precision’s mySITE workstation system offers a fresh look in design, functionality and performance, providing a complete solution for any office. Fixed height, technician height adjustable and user height adjustable desking options are available to meet the needs of today’s dynamic office environment. Furthermore, the desk shape can be selected from options of; straight, 90 degree and 120 degree to best utilise space allocations, and encourage communication, and collaboration, between team members within an organisation. A sleek frame design offers each occupant increased leg room, and incorporates multi-function cross rails, allowing for easy installation or re-configuration of cross rail and desktop mounted workstation accessories. A low profile foot ensures mobile cabinets can be easily placed under all areas of each work surface, and incorporate adjustable glides for leveling of work stations over uneven floors. A full range of accessories are available to personalise each workspace. All Precision products are robustly designed to give years of reliable service, with a minimum of maintenance requirements. 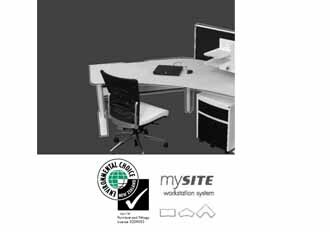 This guide provides recommendations to ensure that you get the best from your mySITE workstation.